Here goes the extra crispy KFC Style Fried Chicken recipe that can be prepared at home without any disappointment. This yummy fried chicken is always a kids favorite and one of those foods that makes everyone mouthwatery. The crispilicious outer texture and tender juicy inside of it makes this dish your family favorite too. Check out the easiest video recipe to make KFC outlet like chicken at your home. Sprinkle salt, pepper pwd, red chilly pwd and squeeze lemon juice on it. Mix and allow to marinate for 30 mins. In a bowl, beat eggs along with milk. In a mixing bowl, add maida flour, salt, pepper pwd, red chilly pwd, onion pwd, garlic pwd, bread crumbs and crushed corn flakes. Now take the marinated chicken and roll it with flour mixture as in video. Dip it in egg mixture. Again roll it with flour mixture. Repeat the same for all the chicken pieces. Drop the chicken one by one in hot oil. Take care not to overcrowd the oil. Deep fry in medium flame until chicken turns crisp and golden. Remove and drain from oil. 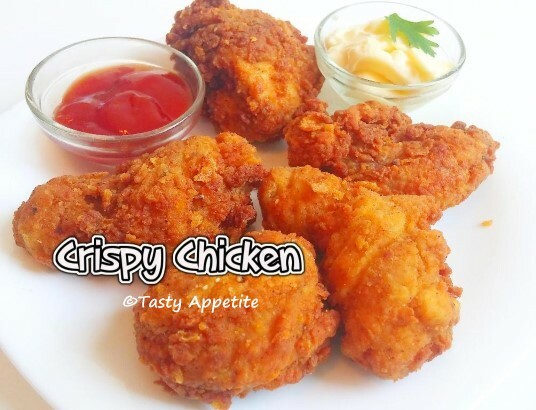 Crispy delicious KFC style homemade fried chicken is ready. Enjoy warm with ketchup and mayonaise. Homemade is always the best and healthy.